Hampstead Garden Suburb was inspired by Dame Henrietta Barnett who was married to Samuel Barnett, vicar of St Jude's Whitechapel and founder of Toynbee Hall. The establishment of the suburb followed the campaign to preserve what is now the Hampstead Heath extension. Mrs Barnett wrote an article proposing housing for working classes and larger houses and shops in 1905. The Trust was formed in 1906 with responsiblilty for house type and plan and street layout. Until 1914 Sir Raymond Unwin was its chief architect. A number of other architects were involved but the Trust's control ensured harmony of character. The suburb extension was laid out in 1911-2 centred on Northway, Middleway and Southway. This did not provide working class housing so the middle classes came to predominate. A 5 mile linear walk from Golders Green Station (Northern line) to East Finchley Station (Northern line). The last mile utilises part of the Capital Ring route (section 11). The walk can be extended by a further 2 miles by continuing along this waymarked walk to Highgate Station (Northern line). This goes through Cherry Tree Wood, Highgate Wood and Queens Wood. It is particularly attractive in the autumn but a good all year round walk as it is mainly surfaced paths. Remember though that Highgate is a hilly area! Details of the Capital Ring can be found on the tfl website. Exit the station into the bus station and go around to the right then along Finchley Road. First right along Rotherwick Road then right at the end into Corringham Road. In Corringway to the right were flats for chauffeurs over garages built in 1909. The present buildings replaced them in 1996. At the end of Corringham Road go right along Hampstead Way. At the end of Heath Close to the right is Waterlow Court. These 51 flats for working ladies were designed for the Improved Industrial Dwelling Corporation by Baillie Scott in 1907-9. Return to Hampstead Way and continue northwards (to the left). There are a variety of houses along this road with numbers 36 - 48 of note. Houses at 22 and 6-10 Meadway are by Baillie Scott. 135-141 were designed by Curtis Green and 143-9 are by Parker & Unwin. 155 has interesting topiary. On the right are Lucas Square by Geoffrey Lucas and Litchfield Square by Parker & Unwin. On the right is the tennis club. Temple Fortune House provides flats. There are shops in Finchley Way which was planned as an entrance to the suburb. Notice the Royal Oak pub opposite. Queen's Court was built in 1927 by the United Women's Homes Association. On the left are Foundation Cottages the first two houses built in 1907, marked with a plaque. Most of this road was designed by Parker & Unwin but 44-56 of 1909-10 were built for the Improved Industrial Dwelling Corporation by Hubbard & Moore. Further along is Willifield Green. The former clubhouse was bombed and replaced by Fellowship House, an old people's centre in 1958. To the left is Brooklands School, rebuilt in 1956. This has flats by Parker & Unwin. Barrett Homestead of 1916-7 provided flatlets for war widows. 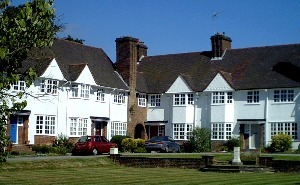 In Holmefield were buildings of 1911-4 for children in care, the elderly and 'tired servants'. Further down to the left is Big Wood, a retained area of woodland. This area was designed in 1906-8 by Sir Edwin Lutyens although his plans were not completed. The Free Church was begun in 1911 but not finished until the 1960s with an interior in pastel colours. In the north east corner of the square the Friend's Meeting House of 1913 is by Fred Rowntree. The Institute and Henrietta Barnett School is an impressive building on the east side. St Jude's Church 1909-11 is in Byzantine style but with a Gothic silhouette. There are a number of paintings inside and the Willis organ from St Jude's Whitechapel (demolished in 1923). Houses in North Square are late 17th century in style. Henrietta Barnett lived at number one South Square where there are flats by C G Butler. There is a memorial of 1938 to her by Lutyens on the west side of the square which has views towards Harrow Church. Houses here are by Sutcliffe and others. The wall with pavilions was designed by Charles Wade but only the west half was completed. Number 1 is by Arnold Mitchell (1910) and number 3 by E P Powell (1920). Houses here include designs by Bunney & Makins. Number 10 is by Lucas (1910) 16 by SBK Caulfield and 18 by Bunney & Makins. Kingsley Close to the left has Art Deco style houses with sun-trap windows and chevron patterned balconies. Opposite the Close go into Lyttleton Playing Fields and follow the Capital Ring route. Exit into Norrice Lea and go left. The Kerem Synogogue and school dates to 1937. Continue along the Capital Ring via Vivian Way and Edmund's Walk to East Finchley Station or Highgate Station. The Corporation of London manage Highgate Wood where an information centre is available Tel 020 8444 6129. A Gallery is located at 16 Arcade House, Hampstead Way which sells cards and publications. Generally open 11-5 weekdays & 11-1 weekends. Tel 020 8455 9132. The archives of the Hampstead Garden Suburb are stored between Bigwood House at the Henrietta Barnet School (open Tuesday 10:30-12:30 by appointment) and the LMA [more info]. You are advised to contact LMA in advance of a visit. Please telephone the archivist at Bigwood House on 020 8458 3688 if you have items you would like to donate.